One of the senior flight attendants I flew with recently told me that she is going to South Korea to see the cherry blossoms. She said that it’s easy to apply for the visa and you can even get it done in one day. Being a flight attendant, we constantly need our passport. So when I heard that the visa can be done that quickly, I was interested. I was browsing for more information and I found all the steps for visa application on their official website called Korea Visa Portal. This website gives you detailed information on what kind of visas available, how to apply, how long the validity of the visa, and other queries that you might be useful for you. For Indonesians, you can find all the information in Bahasa here. The visa that my senior was talking about was Multiple Visa that can be done in one day. The Multiple Visa is the most expensive among all but it is valid for 5 years. I thought to myself, a one-time visit to South Korea will not be enough, so I decided to apply for the Multiple Visa. Before you drop your documents at the visa application center, you need to first make a payment at Hana Bank outside. The payment can only be done in cash, no cards allowed. Here are the fees for different types of visa (updated as per April 2019 when I received my visa). If you look at the list of documents needed on the link I gave above, there’s a bank statement as one of the requirements. But I could not provide it, as the bank where I put most of my money is in Saudi. Meanwhile, I am having a one month vacation now in Indonesia, so I could not print out the bank statement. However, I provided the payslips that my company sends every month. I was so happy to find out that even without the bank statement, I could get my visa approved. I think as long as you can show your financial state and ensure them that you will fly to Korea for tourism purposes and you intend to come back to Indonesia, you will be granted the visa. 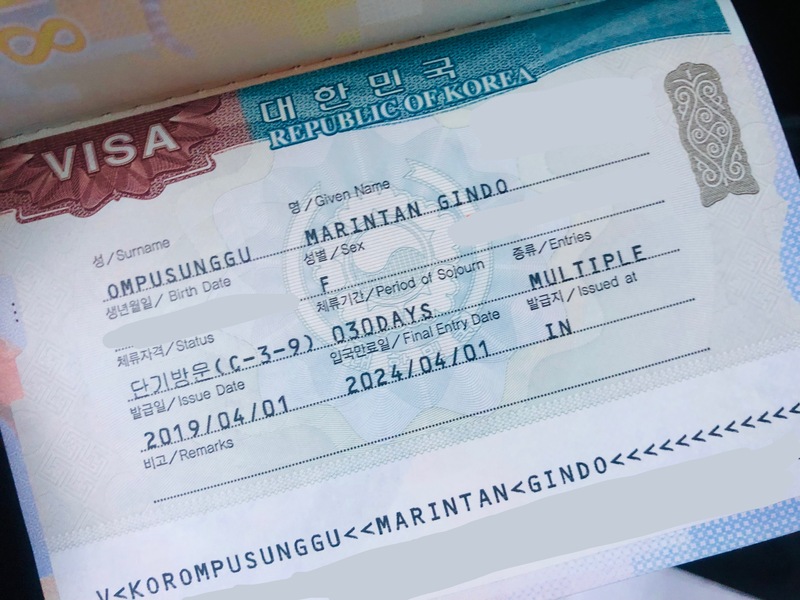 You can apply for Multiple Visa if you have been to Korea before or if you have either US Visa or Schengen Visa and have traveled to those countries before. Some of my friends who have the mentioned visas but haven’t traveled there yet told me that because of this, they can only apply for Single Visa. The process time for Single and Double Visas will be around 6 days. Only Multiple Visa can be processed in one day. If you put your passport between Monday to Thursday, you will receive it back the next day. But if you put your passport on Friday as I did, you will receive it back Monday the following week. Make sure you know the opening hours for visa application and for taking your passport back. 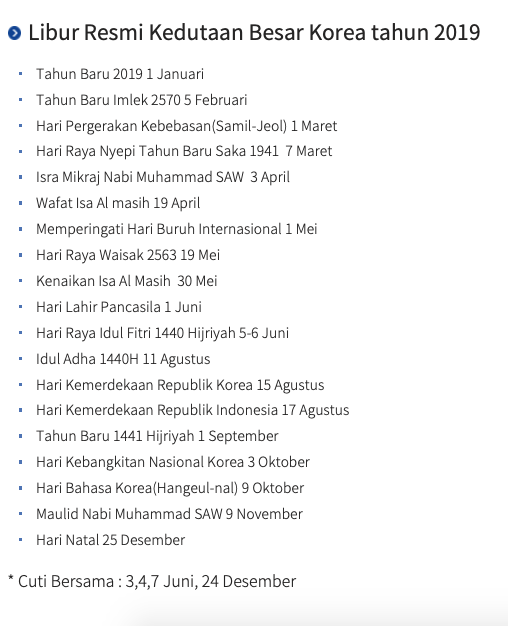 Also, observe the national holidays or Korean holidays to know whether or not they will be open on the dates you intend to apply. 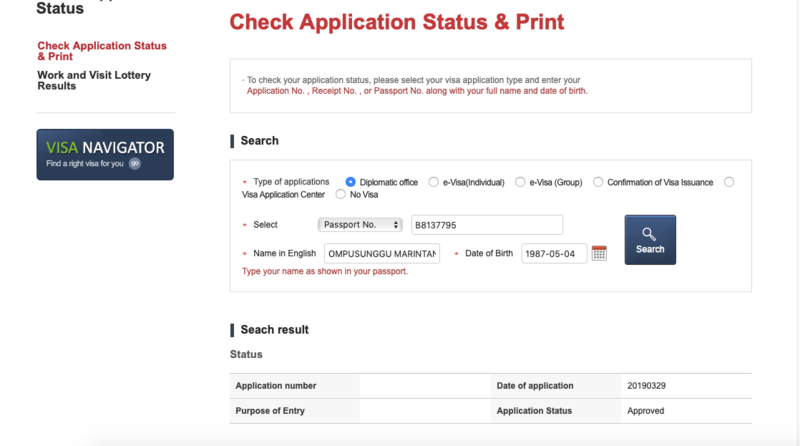 You can also check your visa application status on this website (click here) by putting your information accordingly. This is how the Korea Portal Visa page looked like when I checked the status on Monday morning (April 1st) before I went to the embassy. Put your last name then followed by your first and second name. If you go there by your own car, you can ask permission to have your car parked inside. It is quite hard to get a grab car (go-car or even conventional taxi) from outside the embassy. So I suggest you ask someone to drive you and wait there. The process only takes around 5-10 minutes for those who apply for Multiple Visa and up to 30 – 45 minute for those who apply for shorter visas (single or double).